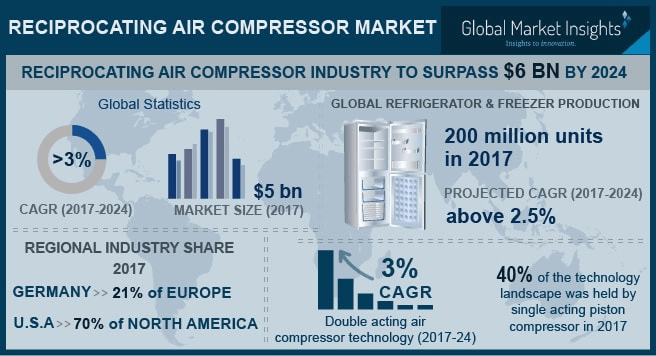 Reciprocating Air Compressor Market size will surpass USD 6.4 billion by 2024; according to a new research report by Global Market Insights, Inc.
High growth in the household appliances market will drive reciprocating air compressor demand as they are extensively used in refrigeration and air-conditioning systems. Asia Pacific is the most significant household appliances market experiencing high growth and increased production. Improving economic conditions, high GDP growth rates, increasing disposable income, and rapid urbanization are fueling the refrigerator and air-conditioner demand in Asia Pacific, mostly in China and India. The global air-conditioner market size in 2017 was more than 110 million units and is likely to boost the reciprocating air compressor demand as they are extensively used in refrigeration & air-conditioning systems. The global refrigerator & freezer production was around 200 million units in 2017 and the industry is likely to grow at a CAGR above 2.5% from 2017 to 2024. Noise pollution can be a restraining factor in the reciprocating air compressor market growth as government agencies of several countries have framed protocols related to the level of noise emitted from reciprocating air compressors. For example, the U.S. noise emission standard states that portable air compressors with a capacity of more than 250 cubic feet per minute should not produce a sound of more than 76 decibels. Such regulations will increase the air compressor manufacturing cost as extra sound proofing materials may have to be incorporated in the compressor, thus hampering the industry growth. The higher cost of newly developed compressors, when compared to the traditional ones, is likely to negatively affect the reciprocating air compressor industry growth during the forecast timeframe. Reciprocating air compressor market is categorized on the basis of product, technology, lubrication, application and region. According to the product, the industry is fragmented into portable and stationary. From these, the stationary air compressor will likely to generate more than USD 4.5 billion over the forecast timeframe. These types of compressors are widely used in manufacturing and other industries for supplying extra air at high pressures. Single-acting reciprocating air compressor is likely to generate over USD 2 billion by 2024 due to excessive usage of the product in automotive and general workshops. Other technologies in the industry include multi stage, diaphragm, etc. and will account for around 20% of the overall industry in 2024. In the terms of value, oil free segment is likely to make over USD 2 billion in future owing to the positive demand for the product in healthcare industry. Oil free reciprocating air compressors also offer industries to perform contaminant-free and cost-effective operations and are employed in end-use industries including electronics, food & beverage, home appliances, etc. Based on application, home appliances will garner over 70% volumetric share of the overall application sectors in 2024. This is all due to the extensive usage of the air compressors in refrigerators, air conditioners, and to inflate tires or other inflatable items in households. Refrigerators and freezers use air compressor to cool the air inside the unit. Air conditioners also have air compressors as their main power source to cool the surrounding air. Air compressors used in household appliances are small in size and capacity. China reciprocating air compressor market will generate more than USD 2 billion in 2024 owing to the large production units of home appliances coupled with substantial growth in automotive sector. This in turn will significantly fuel the Asia Pacific reciprocating air compressor market over the forecast spell. Major reciprocating air compressor industry players include Sullair, LLC, Kaeser Kompressoren SE, Ingersoll-Rand, Gardner Denver., Elgi Compressors, Atlas Copco, Quincy Compressor, Vanair, Frank Technologies, Emersion Climate Technologies, Inc., Hertz and others.